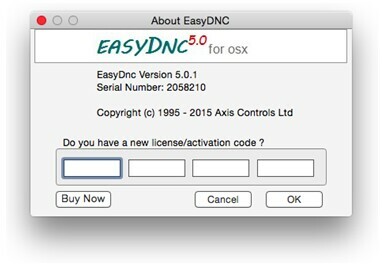 Quick tour - setup and usage of the EasyDNC for OSX. 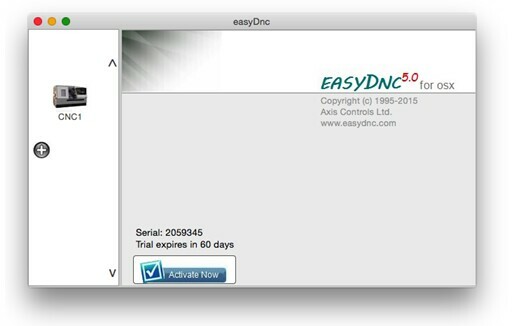 The very first time you use EasyDNC it will prompt for an activation code. You must enter your licence/activation code before using EasyDNC. You can collect a free trial activation code from the downloads page. The EasyDNC program window will appear with one CNC icon named 'CNC1'. Of course you can change the name of the icon via 'Setup' which will be shown on the next page. If you have more than one CNC machine you can add more icons by clicking the (+) button. Each icon will contain an individual 'Machine Profile' allowing you to setup and store the communications parameters for a number of completely different CNC machines. Once you've setup a few machines you can switch instantly from one to the other - and even run a number of them at the same time if necessary. When you click the machine icon a menu appears as shown on the next page.